First off I want to say something: The synopsis is a giant spoiler. Don't read it if you want to be surprised. That’s why I didn’t add it here. There are two common things in all my favorite books: A wonderful writing and at least one larger-than-life character. And Amy Zhang manages to have both of those things in this book. THIS IS WHERE THE WORLD ENDS is a story about a friendship with ups and downs, with secrets and lies, with heartache and pain. But that friendship so full of love. The story is told through Micah’s and Janie’s POVs, in a “then” and “now” format. Usually that kind of storytelling doesn’t work for me, but with the shifts in the POVs and the time line between them, I found it perfect. Amy Zhang’s style is impressed in every page. Her writing is beautiful and magical. Her characters are impossible to forget. Micah’s POV is twisted and gripping. He tells the “now” after he wakes up in a hospital room with no memories of what happened. Janie’s POV is vivid, it’s like a hurricane. She tells the “then”, the events that lead to Micah’s accident. These characters are so realistic: they have flaws, and they make a lot of mistakes throughout the story. But they are remarkable; somehow you learn to care about them. My favorite thing about this book was the metaphors. I loved how they were used. I loved how they made me feel. THIS IS WHERE THE WORLD ENDS is a story about a boy obsessed with finales and a girl obsessed with fairy tales. 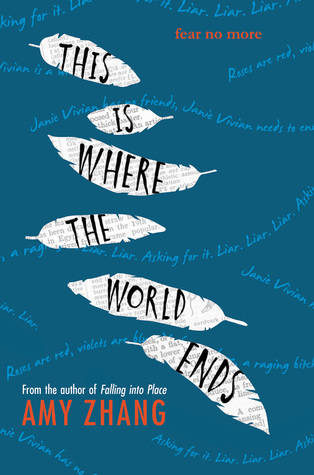 If you loved Amy’s Falling Into Place, then THIS IS WHERE THE WORLD ENDS will make you laugh, will make you cry, will make you feel. I really did. I hope you give it a chance! I didn't request this because while I liked her debut, the writing was a little non-linear for me (which I know was the point...) But I've seen reviewers compare this to Looking for Alaska by John Green, so I'm kind of intrigued. I don't think it felt like Looking for Alaska, but it was really good. I loved the writing the most.